I am a homeschooling mom and am always looking for educational activities for my children to do. I have one child who gets bored super easy, and another who struggles with fine motor skills, coordination and concentration. My second youngest is just getting used to doing more complicated activities and is also learning how to do small, easy things on the iPad. Thank goodness for the iPad...it is such an amazing tool for my children! 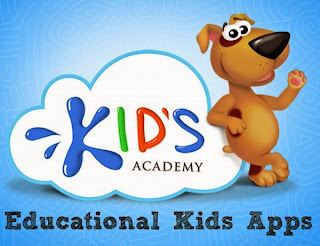 I wanted to take a second to write three brief overviews of some apps from Kids Academy and all three of these helpful apps are free! So, here we go. This app is so amazing. My son, who is 4, is just now learning how to hold a pencil. He is learning super simple things like drawing a line from one point to another, tracing and coloring and he is very uncoordinated so he struggles alot. I love this app because it allows him to use his finger to trace numbers and learn the basic flow of how a number is shaped. He can also learn his ABC's by touching certain places on the screen and hearing words that begin with whatever letter they are talking about. While the app is displaying the brightly colored pictures, the sound is being repeated so he hears as well as sees. This is so important for him because he is a hands on, visual learner. 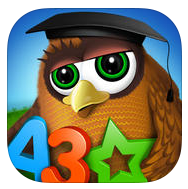 For your little ones, this is a fantastic app. Download this free app on iTunes now! This app is a bit more advanced but not too difficult even for young ones. I found that my 6 year old whizzed through most of the activities but my 4 year old was challenged a bit. The activities are perfect for him. He can use his fingers (tactile learning!) to trace his way through mazes and learn all about rhyming words. I also love that it allows him to practice writing upper and lowercase letters. The music is cute and not distracting at all, which is something that I really look for in apps for my children. Sometimes the music itself can draw their attention away and totally interfere with their focus. 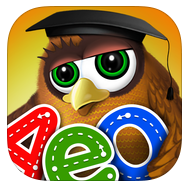 I would definitely recommend this app to parents with younger children who are in the early years of learning the basics of writing and fine motor skill. Download this free app on iTunes now! 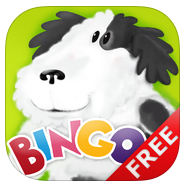 BINGO is such a great song for teaching children how to spell...the repetitive sounds help even the littlest listener to learn. This app is great for my 2 year old and my 4 year old. It has a catchy song, bright videos and is easy to understand. Basically, this app is a song with colorful pictures and encourages children to sing and clap along with the music. You can also record your child singing along! My 2 year old LOVES the song BINGO and this will be a favorite for him. Download this free app on iTunes now! So, there you have it. Some really great apps for the younger ones in your home and these apps will keep them occupied, learning and having fun all at the same time! Check them out today. Disclaimer: This was a sponsored post and all thoughts and opinions are 100% mine.